woww The first challenge with my sketch was a great succes! So many sugar nellie fans!! Thank you so much and now you can work on the second challenge! The theme is "three"! We would like to see your cards with 3 different DP (no more or less!) and also 3 different types of embellishments. My choice was 3 papers from My minds eye, Flowers, Ribbon and Pearls. 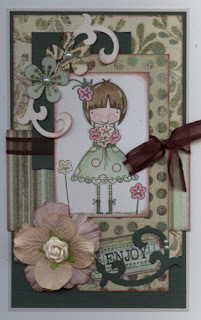 The stamp is a new one from Leanne Ellis Design calles Blossom/ I've colored it with distress inks! I hope you will join in the challenge as there are 3 great prizes to be won!! So I hope you will all join in and try your luck! Check everything out on the Sugar Bowl blog! Have a nice day and thanks for watching! Beautiful card Tiets, I love the colours you have used. I have this stamp but have not yet had time to play with it. I missed the first challenge as I have just got back from Holiday, but I will have a go at this new one. I did however love your sketch and will try to use it in a challenge soon. Great card tiets..so beautiful! You have coloured the image so well. Just gorgeous (as always) I just LOVE IT! Thank you for being such a Sweetie! Another beautiful card Tiets! Your sketch for the first challenge was so wonderful! Your "3" card is so beautifully done! prachtig kaartje heb je weer gemaakt Tiets. Your card is stunning! I love the colour scheme and layout you have used. Lovely coloring Tiets! Great cards and love your papers! Have a great day! Prachtige kaart Tiets, mooi die groene tinten! Tiets, wat een BEAUTY!! hele mooie kleurencombinatie. Ohhhh this is sooo gorgeous!!!! Love your amazing talent for coloring! gorgeous soft colors! Love this card! Stunning! Love the muted colours! A peak in my scrap room!